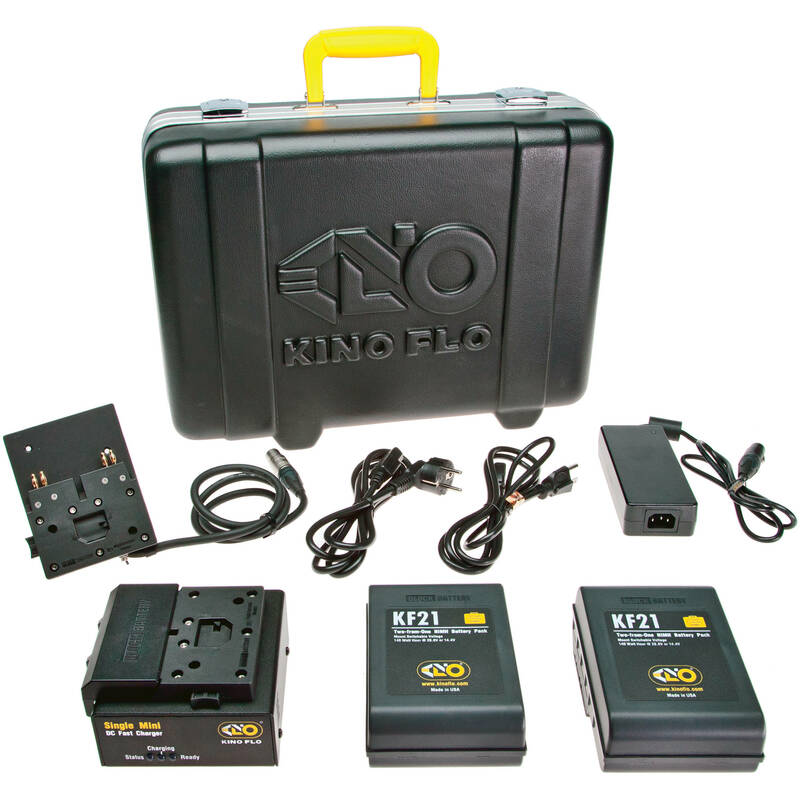 The Block/KF21 Single Battery Kit with 2 Batteries is a handy system for powering a wide variety of Kino Flo LED lights (see Compatibility). The kit includes two KF21 NiMH 140Wh batteries that provide 70 minutes of run time on a 1.5 hour charge via the included Fast Charger with Power Supply. A 3-pin Mafer Mount for the batteries is included as is a hard Travel Case for storage and transport. Made to charge the KF21 nickel metal-hydride battery, the Single Fast Charger System with Universal Power Supply from Kino Flo and BlockBattery has a 3-LED charge status indicator and will recharge the KF21 in 1.5 hours, far shorter than most lithium-ion batteries. The system includes a Universal Power Supply with 100-240 VAC input and 48 V, 2.5 A output. The system is compatible with Celeb 250 LED DMX, Diva-Lite 20 and 30 LED DMX, FreeStyle 31 and 21 LED DMX, and Select 20 and 30 LED DMX fixtures. Partnering with BlockBattery, Kino Flo has created the KF21 Nickel Metal-Hydride Battery to power their LED fixtures. The 140Wh, 28.8V battery provides 1 hour 10 minutes run time for compatible light fixtures and recharges in 1.5 hours in the charger that's made for it. Battery adapters may be used to access 14.4V for products that have 14.4V inputs. The KF21 is compatible with Celeb 250 LED DMX, Diva-Lite 20/30 LED DMX, FreeStyle 31/21 LED DMX, and Select 20/30 LED DMX light fixtures. The KF21 Mafer Mount from Kino Flo is a handy way to provide power to the Celeb 250 LED, Diva-Lite 20/30 LEDs, FreeStyle 31/21 LEDs, Select 20/30 LEDs and Celeb 850 LED lights. The mount attaches to a stand via the mount's 5/8" receiver and a Mafer or similar clamp. The LED light itself, can then attach to the stand's 5/8" pin. The 28.8V K21 battery attaches to a housing built into the mount and the included 3-pin, 3' XLR output cable is then attached to the light. The arrangement keeps the battery off the floor and places it and the stand in line with the light and its controls. Box Dimensions (LxWxH) 12.1 x 10.7 x 10.1"
Box Dimensions (LxWxH) 6.7 x 5.4 x 3.3"
Box Dimensions (LxWxH) 6.8 x 5.5 x 3.3"